To compliment the superb range of Tarox performance brake discs Tarox have produced a range of 4 performance brake pads to suit all driving styles and conditions.From fast road to race Tarox has a pad to suit. Each Tarox performance pad has been engineered to reduce stopping distances and reduce brake fade. 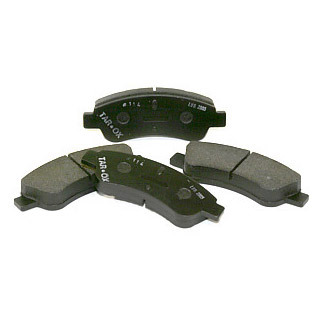 All Tarox�s performance brake pads have been designed to replace the existing factory pad resulting in better pedal feel and reduced stopping distances. Tarox pads can be used with standard O.E discs but are better suited to their premium range of Tarox performance discs. Tarox performance brake pads have been engineered for each cars specific application, meaning compounds change from car to car. Tarox brake pads are a little more expensive than other manufacturers but the specific engineered compounds will probably outperform other leading brands. Primarily intended for track use the Tarox Corsa 114 pad can also be used for fast road use as they are effective from cold. The high coefficient of friction (0.47) gives plenty of pedal feel and massive amounts of bite. Able to withstand temperatures of up to 800 degrees centigrade. This pad has an optimum temperature range of 200 to 400 degrees centigrade so is ideal for fast road and track days. The compound used on these pads is formulated for each specific car. This is not a generic compound it is engineered for each specific application - true performance! Fit Tarox Performance discs for even more stopping power!